A Townhouse will be available by 4/15/2019. The Floor Plan of the Ranch has approximately 740 sq feet. This apartment has 2 full bedrooms, a full bathroom with a tub, a galley kitchen with a pass through to a combination living / dining room. Loads of closets. A utility room houses an On Demand Hot Water Heater, a water meter, Electric breaker box and a hookup for a washer and dryer. 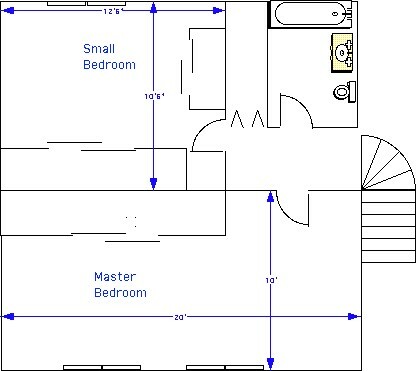 Roll your mouse over the small pictures to see the floor plan. 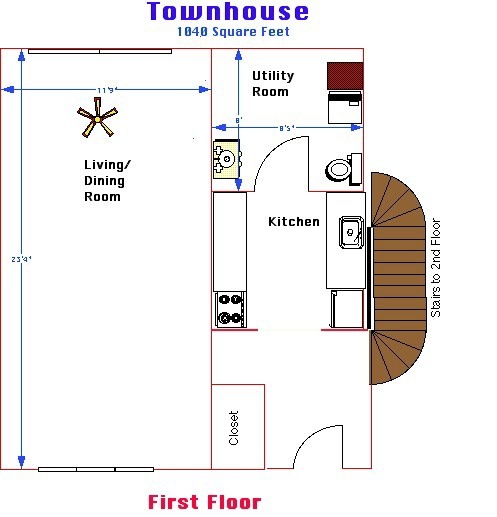 The Floor Plan of the Townhouse has approximately 1040 sq feet. This 2 story apartment has 2 full bedrooms with plenty of closets and 1 full bathroom with a tub on the second floor. The first floor has a galley kitchen with a frost free refrigerator, a gas stove, a butcher block countertop with a passthrough to a combination living / dining room. Off of the kitchen is a Utility room which houses an On Demand Hot Water Heater, a water meter, Electric breaker box and a hookup for a washer and dryer. Additionally there is a 1/2 a bath consisting of a sink with a vanity and a toilet.